After creating your contact-based workflow, setting your enrollment triggers, and choosing your workflow actions, you can edit your workflow settings. Click the name of a workflow, or click Create workflow. What days do you want actions to execute? 7 days a week: actions can execute on any day of the week. This option is selected by default. Business days only (Monday - Friday): actions can only execute on business days. Any actions scheduled to execute on Saturday or Sunday will be rescheduled for the same time on the following Monday. The Business days only (Monday - Friday) setting will not reschedule delays. Any scheduled delays will continue to execute over the weekend. This Business days only (Monday - Friday) setting does not prevent actions from occurring on holidays. What time of day do you want these actions to execute? This setting allows you to set what time the workflow actions can execute. By default, this option is set to Anytime during the day. If you want your workflow actions to execute during a specific time range, select Between the hours of:. Then click the dropdown menu and select a time range. This time is based on the timezone selected in your account settings. If an action is scheduled to execute outside of the specified time range, when that originally scheduled time arrives, the workflow will reschedule the action to execute at the next available time within the specified time range. Allow contacts to be enrolled in this workflow from Salesforce? This setting allows you to decide if Salesforce leads or contacts can be enrolled in your HubSpot workflows. If you want Salesforce leads or contacts to enroll in this workflow, select Yes, allow enrollment from Salesforce. The Salesforce lead/contact must exist in HubSpot as a contact. The HubSpot-Salesforce integration must be correctly installed. The HubSpot Visualforce window must be added to your Salesforce lead and/or contact page layouts. Learn more about enrolling your Salesforce leads or contacts into HubSpot workflows directly from Salesforce. If you're a Marketing Hub Professional or Enterprise user, this setting allows you to associate your workflows to any of your campaigns. Click the Campaigns associated with dropdown menu and select a campaign name. This setting allows you to decide what will happen to enrolled contacts who are also enrolled in another workflow. By default, contacts will not be removed from other workflows. Do not remove them from other workflows: contacts will remain enrolled in other workflows. Remove them from all other workflows: once the contact is enrolled in this workflow, they will be removed from all other workflows. Remove them from a specific workflow: once the contact is enrolled in this workflow, they will be removed from any workflow you select from the dropdown menu. Click the Remove them from specific workflows dropdown menu to select the specific workflow(s). When a contact no longer meets the enrollment conditions, remove them from this workflow? This workflow setting determines whether a contact will be removed if they fail to meet the enrollment criteria once they've already been enrolled. The No, keep them in this workflow option is selected by default. Select Yes, remove them from this workflow to remove contacts when they no longer meet the starting enrollment criteria. Please note: if you have a contact currently enrolled in the workflow that did not meet the enrollment triggers before this setting was enabled, they will not be unenrolled from the workflow once the setting is enabled and you will need to manually unenroll them. This setting also applies to test contacts. If you enroll a test contact that does not meet the enrollment triggers when this setting is enabled, they will be automatically unenrolled from the workflow and will not execute any of the steps. Click the Suppression lists for this workflow dropdown menu and select a list of contacts that you don't want enrolled in the workflow. Contact is not currently enrolled in the workflow and is a member of the suppression list: the contact will not be enrolled in the workflow even if they meet the enrollment triggers at a later time, and will appear in the workflow's history as being found in a suppression list and unenrolled. Contact is currently enrolled in the workflow and is a member of the suppression list: the contact will be unenrolled when they reach the next step in the workflow. Contact is currently enrolled in the workflow and is not a member of the suppression list: the contact will remain in the workflow. However, if they meet the criteria of the suppression list at a later time (while still active in the workflow), they will then be unenrolled. 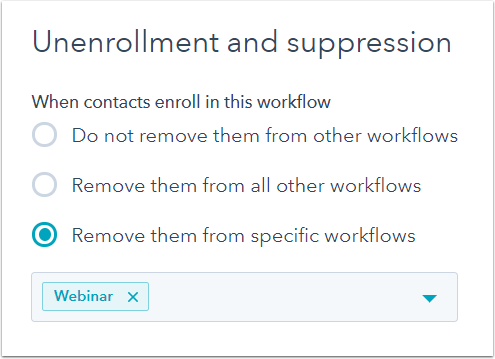 If a contact is removed from a suppression list, they will not automatically enroll in the workflow even if they still meet the workflow's enrollment triggers at the time. Contacts are only enrolled in a workflow at the moment they meet the workflow's enrollment triggers or re-enrollment triggers. Only Marketing Hub Professional and Enterprise users can create suppression lists for workflows. If you are a Sales Hub or Service Hub Professional or Enterprise user, learn how to unenroll or exclude contacts in contact-based workflows with goals.